Duct End Cap 'no crimp'(10 Inch) (FC 10 ) by Luxury Metals LLC at The Synthesizer. MPN: FC 10. Hurry! Limited time offer. Offer valid only while supplies last. Duct End Cap Made of heavy duty 26 gauge galvanized steel. Made to fit over duct run pipe. Also called tee cap and duct cap. Available in Aluminum. View More In HVAC - Page 2. Duct End Cap Made of heavy duty 26 gauge galvanized steel. Made to fit over duct run pipe. 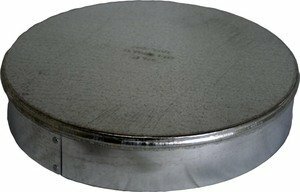 Also called tee cap and duct cap. Available in Aluminum. Call or Email for Price.